Tailgating is not that unique. Tailgating in a caboose? A little more so. Unlike most of the college football stadiums in the Southeastern Conference, the University of South Carolina's Williams-Brice Stadium is located about a mile off campus in a primarily industrial part of Columbia. 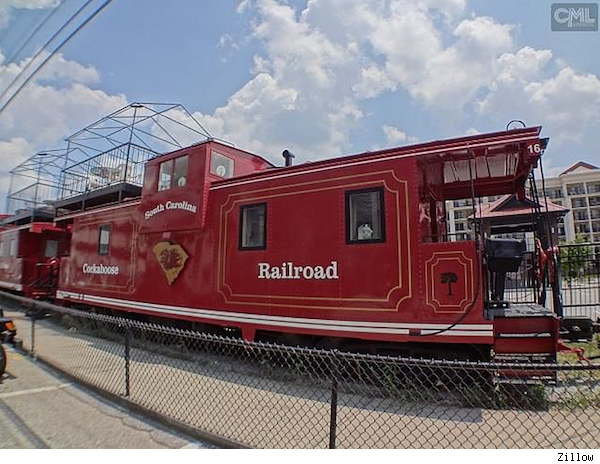 The location has resulted in some pretty unusual real estate opportunities, including a row of 22 cabooses, coined "Cockabooses" for the South Carolina mascot: the Gamecock. "The stadium was essentially built in a warehouse district, so tailgating development sprung up all around," explained Columbia real estate agent and token Cockaboose expert Whit Suber. He explains that the Cockabooses began when a developer came up with an idea to hook cabooses to a train and pull them 20 miles from a local country club into the stadium. The idea didn't end up panning out, so instead, the developer bought land rights near the stadium and parked the cabooses, all 22 of them, in a 50-yard row in March 1990. The developer then turned around and sold the cabooses, which at that point were empty shells and priced for just $45,000. In 48 hours, 20 of them sold. Since then, very few have changed hands. "Definitely as far as Southern college football lore, it's a pretty big deal," Suber said. "Every college game day, when the games are televised, they [announcers] can't help it -- they have to talk about how unique they are." Each caboose is decked out differently, Suber says. Some are pretty elaborate, but all of them have a small kitchenette, a bathroom and a deck for viewing the stadium. They're a place for owners to host tailgating parties, stay in the night before an earlier game and a bragging right. The Cockabooses' popularity led to more development around the stadium, including the more recent "cockaminiums," which offer the same appeal as a Cockaboose but in a more traditional setting. How do you sell and market a Cockaboose or cockaminium? While real estate markets can play some role in the value of the caboose or condo, the biggest factor is the success of the Gamecock football team. Luckily for Suber and the owner of the Cockaboose, the team is projected to do well in the upcoming season. Find more homes for sale in Columbia, S.C., or search listings in your area.